What are those hordes of yellow aphids sucking juices from common milkweed (Asclepias syriaca) "reserved" for monarch butterfly caterpillars? They are Oleander Aphids (Aphis nerii) and their appearance on milkweeds reminds us that nature makes no food reservations. 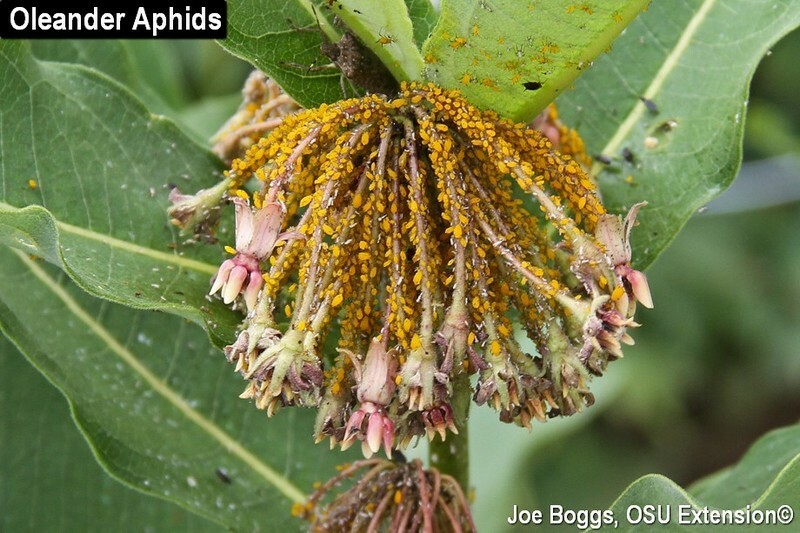 This non-native aphid is best known for feeding in highly aggregated populations on members of the dogbane family (Apocynaceae); most notably on plants in the genera Asclepias (milkweeds); Cynanchum (climbing milkweed, C. laeve), Vinca, and Nerium (oleander). However, these "cosmopolitan feeders" may also be found sucking juices from over 50 hosts belonging to 16 plant families including Crassulaceae, Solanaceae, Asteraceae, Convolvulaceae, and Euphorbiaceae. Of course, it's their mass appearance on common milkweed that draws the ire of monarch mavens. Oleander aphids are parthenogenetic meaning that there are no males; all the aphids of this species are females. This partially explains why this aphid can rapidly develop high population densities. They also seem to be resistant to high summer temperatures which is unlike many other aphid species that are most prolific during the cool temperatures of spring and fall. Oleander aphids also enjoy chemical protection against the depredations of some predators. The sap of oleander and milkweeds contains cardenolide glycosides (alkaloids) which are serious toxins. As with a number of other insects that feed on plants in the dogbane family, the aphid incorporates the glycosides into their flesh as protection against predators. It is speculated that the bright yellow coloration of the aphid warns predators against taking a taste. On the other hand, some insects are unaffected by the aphid's chemical shield. Although research has shown the aphid's honeydew contains alkaloid glycosides, the chemicals do not dissuade some ants from "tending" the aphids in exchange for a sweet treat. There are also several predators that are not thwarted by the aphid's toxic flesh including Syrphid fly larvae, lacewings, and even some lady beetle larvae and adults. Of course, these predators may be cowed by the ants. A common nemesis of oleander aphids as well as a number of other aphids is the parasitoid wasp, Lysiphlebus testaceipes. The wasp lays eggs in the immature aphids; one egg per aphid. Parasitized aphids are called "aphid mummies" for their swollen, dark brown bodies enveloped in a dry, parchment-like exoskeleton. There is little doubt that heavy oleander aphid infestations can damage common milkweed. Whether or not the damage affects the survival of monarch caterpillars has not been studied. However, the combined plundering by beneficial insects is known to provide significant control of oleander aphids. Of course, patience is required; it takes time. If you're impatient, heavy aphid infestations can be reduced with a focused stream of water (great fun!) or by making an insecticidal soap application, but don't spray soaps onto monarch caterpillars. Both approaches will help to preserve the beneficial insects and will not harm pollinators visiting the flowers.